Mr. Silvio Iacovino, the Sofitel Bellecour General Manager and his HR Manager came to present Accor Group and the Sofitel brand to students, as well as internships and career opportunities. 126 hotels in 40 different countries: that’s where the Sofitel brand of the Accord group operates all over the world. Facts and figures, strategy, but most of all, advice and opportunities in this hotel chain. This is what Mr. Iacovino, the General Manager and Mrs. Massacrier, the Human Resources Manager of the Sofitel Lyon Bellecour Hotelpresented to Vatel Lyon students. Hello Mrs. Massacrier. Could you please tell us about what you did before starting to work as the Sofitel Human Resources Manager? I did my final vocational degree internship at the Marseille Sofitel where I was then hired. I worked there for ten years as the an Executive and Human Resources Personal Assistant, before going back to school to get a Master’s Degree in Human Resource Management and do my current job in the Lyon Bellecour Sofitel: Human Resources Manager for the hotel. Could you present Accor Group to us and its development strategies? What is Sofitel’s position as compared to the other Accor brands? The Sofitel brand is a part of the “Luxury - Upmarket” sector, as is M Gallery and Pullman. Sofitel has changed a lot over the past few years: we went from 206 Sofitel Hotels in 2006 to 121 in 2010. Sixty Sofitel Hotels were rebranded as Pullman Hotels, 52 closed and 29 were opened. Between 2010 and 2015, 30 new Sofitel Hotels were and will be opened throughout the world in strategic cities. Sofitel’s vision: Sofitel and its Ambassadors pay tribute to the French world of elegance with a unique collection of locations, thus giving their guests and partners authentic French service that generates emotion, performance and excellence. 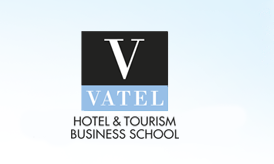 What opportunities can Sofitel offer to Vatel students? What advice for the future would you like to give to Vatel students? Like Mr. Iacovino always says, the hospitality sector is composed of jobs you have to have a vocation to do and love doing, where know-how and knowledge are indissociable from people-oriented skills and conduct.